My daughter is My Little Pony obsessed. She loved them when she was little (me, too!) and now she loves them as a tween. Now that she is a little older, her love for My Little Pony involves Cosplay, watching YouTube videos of the voice actors at ComicCon and enjoying her favourite twentysomething YouTubers who also love My Little Pony. One of her good friends at school is a secret Brony (a boy or adult male who loves My Little Pony). 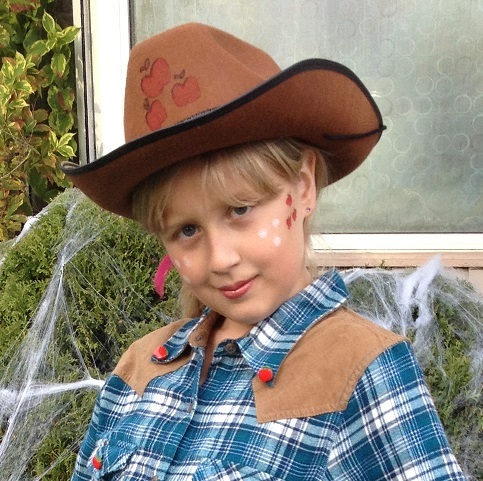 When she dressed up as Applejack for Halloween last year, her Brony friend congratulated her on pulling off her first MLP Cosplay – she unlocked an achievement! She was thrilled when we were asked to Review the new My Little Pony: Friendship is Magic “Cutie Mark Quests” compilation DVD. She loves that the DVD is not just a season of episodes in order, but instead the episodes on this disc focus on the Cutie Marks each of the My Little Pony’s have. My Little Pony helps children learn how to resolve conflicts and be better friends to one another. Every pony and every child brings a unique gift or talent to the world – it is their cutie mark. Learning about what makes one special is an important part of a child’s world – so this is a perfect collection to own and enjoy. We will be taking this one on the road to the Cottage as it is sure to keep both of my kids entertained. My 5 year old little guy is definitely a Brony in training and I wouldn’t have it any other way! The DVD is approximately 110 minutes long and features a bonus Sing-Along! Visit ShoutFactory.com for more details. Shout Factory is releasing this DVD on June 30th! 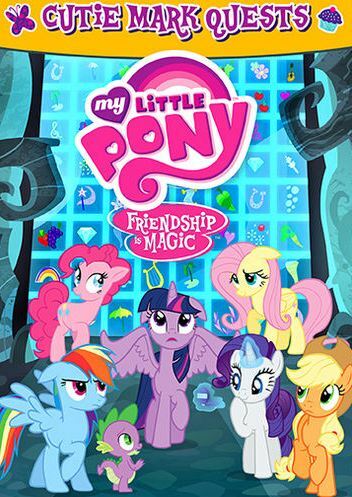 Would you like to win your very own copy of My Little Pony: Friendship is Magic “Cutie Mark Quests”? Enter below! Tweet daily for bonus entries. Be sure and follow Shout Factory on Twitter and Facebook. Contest is open to residents of Canada, 18+, Sorry No Quebec. Contest closes on July 2nd. Thanks and Good Luck! 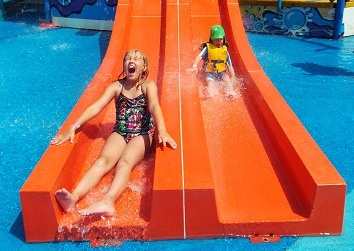 On my Summer “Big Bucket” List was a trip to Bingemans Big Splash. Earlier in the Summer my daughter and I visited King’s Island Amusement Park and enjoyed their wave pool so much that I started looking for local wave pools to try out! Local radio station Country 106.7 had a contest to win tickets to their Bingemans Big Splash “Country Splash Down” event day in July and we won a family four pass! That day was rainy and just as the kids were in their suits and ready to swim, the skies opened up and the pool was closed! We got dressed and headed inside to watch the kids play on the climber and slides. My son with Autism did not understand why we couldn’t swim and he was very upset, but the climber and slides calmed him down and he had a lot of fun. Soon, the rain ended and the sun peeked through, but we still didn’t get to do too much swimming that day. Later in the Summer, I won 4 passes from 91.5 The Beat radio (they have a fantastic call in contest tied to their Top 9 at Noon). I tried for about 2 weeks and finally got through and won the 4 splash park passes and a family pass to African Lion Safari (stay tuned for that review in a few weeks). We picked one of the forecasted hot and sunny days in August to return to Bingemans Big Splash. No rain this time, and the day was just beautiful. My daughter is timid about rides, so we didn’t go on any of the big slides, but by the end of the day she was happy to slide in the Bucket area. Both kids had the best time. My son really enjoyed the bubble pool to the side of the wave pool. Later in the afternoon it started to get super crowded and we headed home with lots of happy memories! For more information, visit Bingemans Big Splash! Please check out my Bingemans Big Splash Flickr album. I’m a city girl, raised in Brooklyn, NY. About 17 years ago I moved up to Canada and “got stuck”. I love the INDOORS and would not describe myself as a nature girl. I’m also a wishful vegan. That is, I wish I were vegan, my animal loving heart wishes I were vegan. Unfortunately, I have a meat addiction I just can’t shake! I am raising two vegetarian children though, so I’m hoping that at least the next generation will be more likely to become vegan! There may still be hope for me yet – in an effort to become healthier, I decided in the Spring to join a CSA (Community Supported Agriculture) and get fresh organic veggies delivered to my door. That is until I saw the cost! The initial outlay ($400 for 8 weeks) was beyond our means. But then I found Theresa at “Garden Party“. She was offering the opportunity to complete a workshare in exchange for fresh, organic veggies! I immediately sent an email and was very happy to get in to the Spring session! Each week I committed to work 4 hours (shift started at 8:30am mid-week) and in exchange I received two big bags of fresh organic veggies, herbs and fruit every 2 weeks. I ‘earned’ approximately $10/hr in food. The work varied. I hoed, weeded, put organic friendly plastic sheeting down (to prevent weeds and keep moisture in the soil), hauled bricks, turned ornamental grasses into hay, put out mulch and cardboard to protect the soil and inhibit weeds, trimmed raspberry canes and strung them up on supports, and when it rained, I painted indoors. No planting, no harvesting. A list went out every 2 weeks so I could select food for the pick-up. Early in the workshare (in May), there were canned items available in addition to many root vegetables stored over the Winter. By the end of the workshare (in June) there were many fresh greens to choose from and I loved getting lots of asparagus! I always left physically exhausted, but spiritually renewed. It was such a gift to help out on the farm and enjoy the sights, smells and sounds. The birds, bugs and frogs serenaded us. The sun kept the mosquitoes at bay (although I donated plenty of blood). It was a wonderful experience! I’m happy to be returning again in the Fall – when I can look forward to the bounty of the harvest. Check out my “I’m a Farmer” Flickr Album to see more! For more information about this workshare, visit Garden Party. For information about CSA’s in Ontario visit the Ontario CSA Directory. 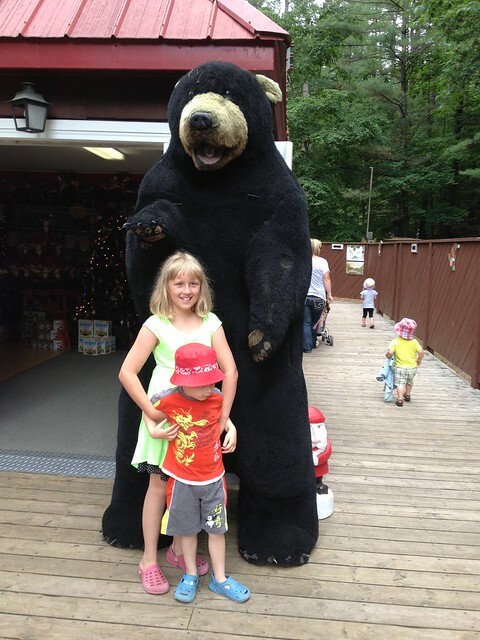 Reposting my 2014 Review – check out the links at the bottom of this post for details on how to WIN tickets to Santa’s Village for use during the 2015 Season! 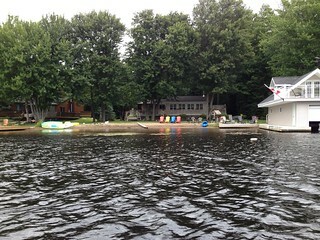 We are very lucky to have access to a family Cottage near Muskoka, which allows us take a vacation on a beautiful lake with minimal expenses. We have been going for years, but had never been to Santa’s Village. 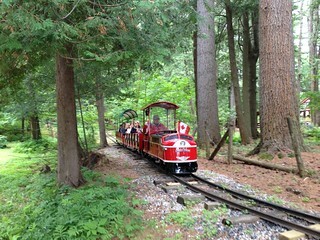 Thanks to a WIN from a contest run by “Help, We’ve Got Kids: Toronto” we received a Family Four Pass to use any day this Summer! 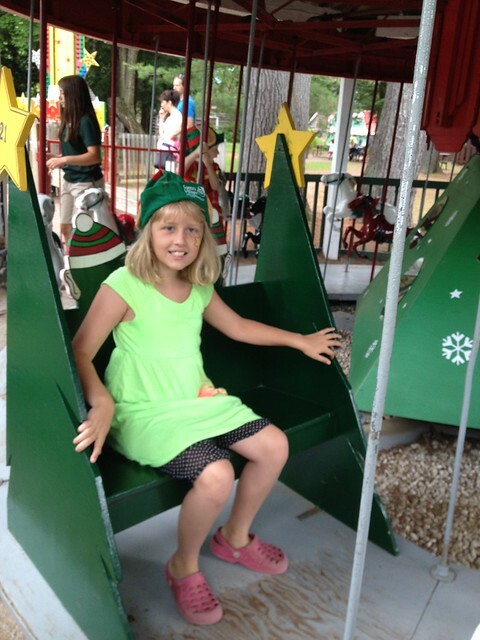 This Summer has had a lot of cool days, so we decided on one of those days in July when it was not exactly swimming weather, it would be the perfect day to keep the kids occupied at Santa’s Village! Then we headed up the path and my daughter HAD to get her face painted (I was concerned about the picture with Santa, so I insisted on a ‘cheek paint’ only). 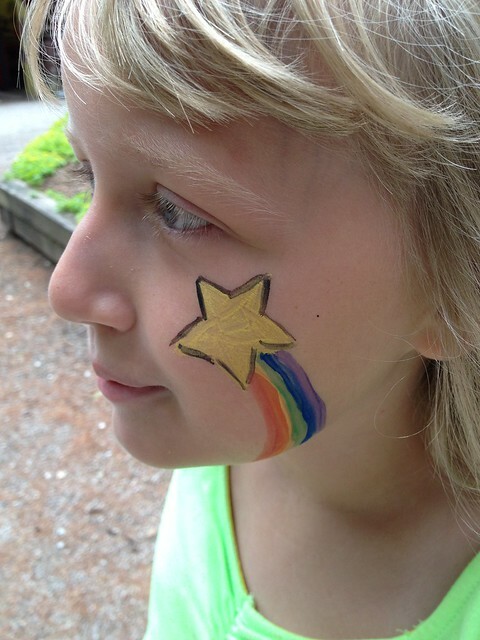 The face paint artist created exactly the symbol my daughter requested! We arrived just as RONNO was performing (every Summer, Santa’s Village attracts some of the most talented children’s performers in Canada). Everybody was dancing (and I got to remember when my 10 year old was little and I’d take her to see Ronno at the Kitchener Market’s Kids Hop). 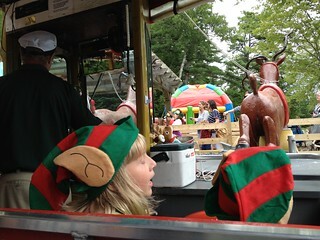 NOTE: Any children left unattended will be put to work as Elves! 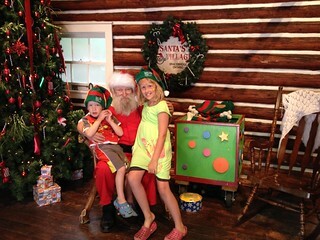 We found SANTA – the kids posed with Santa for what will have to be our Christmas card this year! My son loved Santa’s BEARD! Now that the kids met Santa, they were ELVES. There is nothing more adorable than watching your two little elves running around all day, playing and smiling at Santa’s Village. 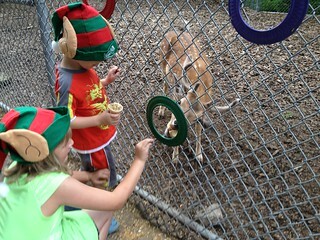 They loved feeding Santa’s reindeer. 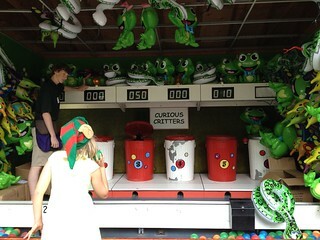 They have carnival games that are FANTASTIC. For one low price, your child can play until they win – a prize is guaranteed and it is no ‘booby prize’ – it is a full size, choose whatever you like prize! The RIDES! My kids are 10 and 4. My 10 year old daughter is terrified of roller coasters (they have one at Santa’s Village, but there was no way she was going to go on it). 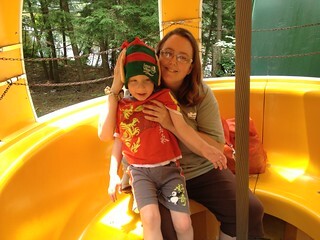 My 4 year old son has autism and is pretty good about going on rides, but we worry about losing him and don’t always know what he ‘wants’. 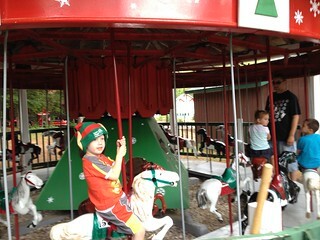 At Santa’s Village, there were lots of opportunities for my son to climb and slide and burn up any energy he had. The park is big enough, but not so big that we ever worried about losing him. He let us know quite clearly what rides he wanted to go on, and after one turn on the carousel with his sister, he was able to go on and off the ride independently. 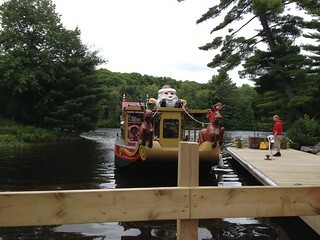 We took a ride on Santa’s Summer Sleigh (a river cruise) – it was so much fun! Beautiful waterway. Fun music played like the Gilligan’s Island Theme Song. We also went for a ride on the Train. 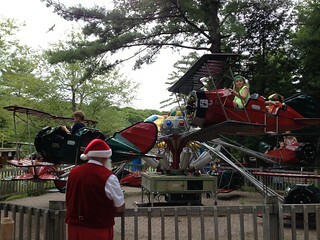 Santa often comes out to watch the children on the rides! He waves at them and jingles his jingle bells, sometimes he gets on and goes for a ride, too! They have a JUMPING star ride, that looks a lot scarier than it is. The motion is much more of a gentle bounce and not a feeling of plummeting. My TIMID 10 year old decided to get brave and try it after watching her brother and I survive and laugh a lot! Great memories! When my son saw the Ferris Wheel, he had to go on it immediately! 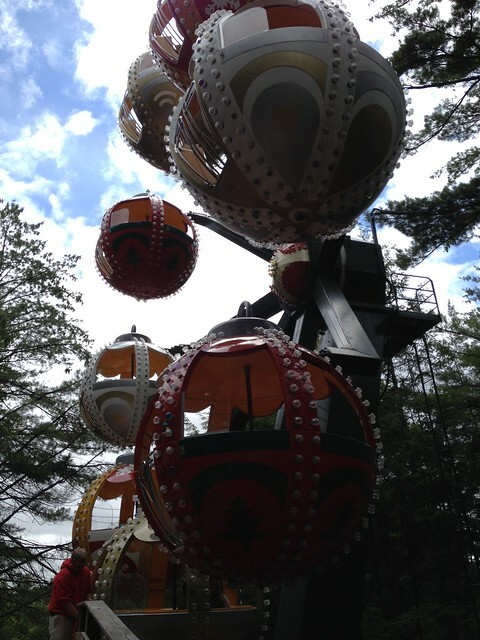 You sit in a big Christmas ornament and enjoy the beautiful wooded views! 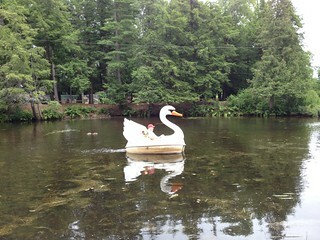 I sent my family onto a paddle boat swan while I took pictures! I love these swans! 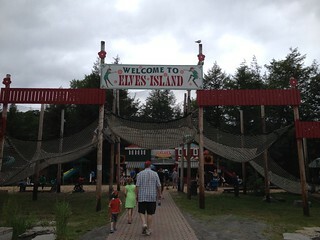 We followed the signs to Elves Island, where the kids bounced, climbed, coloured and went down slides. So much fun, and definitely helped them burn energy on a day when we’d have been hearing lots of “I’m BORED” from my daugher at the cottage! The Staff were so friendly! The operator of the Ferris Wheel offered to take a picture of my son and I.
Santa’s Village is so CLEAN! It seemed like every 20 minutes we were passed yet again by the two teen girls on garbage duty – they always had a friendly smile and greeting, and they were constantly keeping the park pristine! I was very impressed! 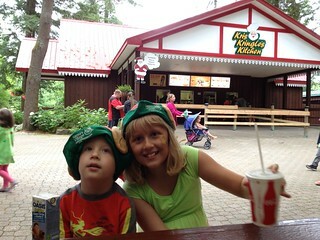 The kids were hungry and tired of all of the healthy eating we were doing at the cottage. Luckily, Santa’s Village has Pizza Pizza! We enjoyed a family meal deal (a large pizza, 2 pops and 2 juice boxes)! The pizza was so huge we couldn’t eat it all. 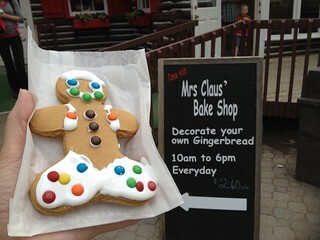 Later my daughter decorated a Gingerbread Man at Mrs. Claus’ Bake Shop and I enjoyed COMPLIMENTARY COFFEE! This is not a park where you leave feeling overcharged and used – they treat you like family and give everyone the best experience! We will definitely be returning again! Perhaps this month (in August 2014, there’s 2-for-1 admission every Friday and Monday). Thank you so much to “Help, We’ve Got Kids: Toronto” and to Santa’s Village! When they heard we were headed to the Muskoka area, they offered to hold our prize win at the front gates rather than make us wait for it to arrive in the mail. That kind of exceptional customer service was evident the entire day! Ho-Ho-Ho Merry Christmas in July! Updates! We returned again in August. 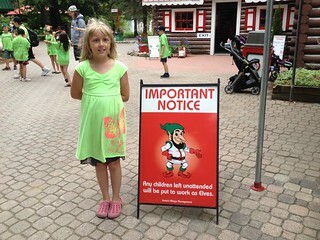 During August, Santa’s Village offered 1/2 price admission (or Buy One Get One) ticketing on certain days. We headed out on a cloudy, overcast ‘iffy’ day. 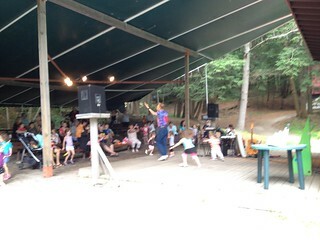 We had a great time, but it did rain – not enough to shut everything down, but enough to get the kids wet. Later, we went to see Erick Traplin perform (a local Kitchener-Waterloo legend) and the skies opened – it poured and poured for over an hour (but we were nice and dry in the covered theatre enjoying the show)… But don’t worry! 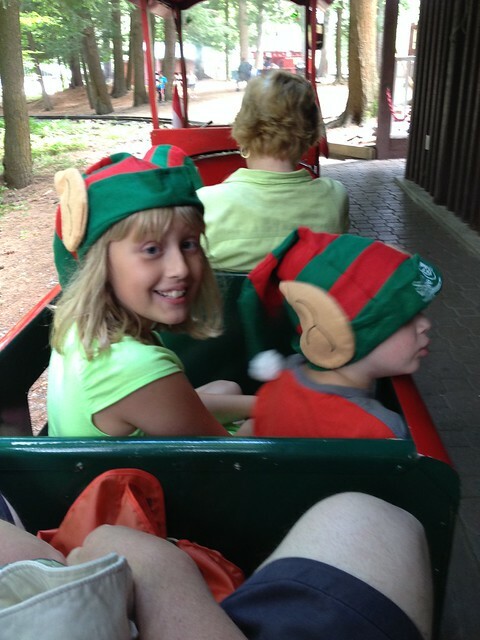 Santa’s Village has a rainy day policy and our entire family received a ‘rain check’ so we can visit again in the following season! We will definitely be returning in 2015! Want to win a family pass? Stay tuned! 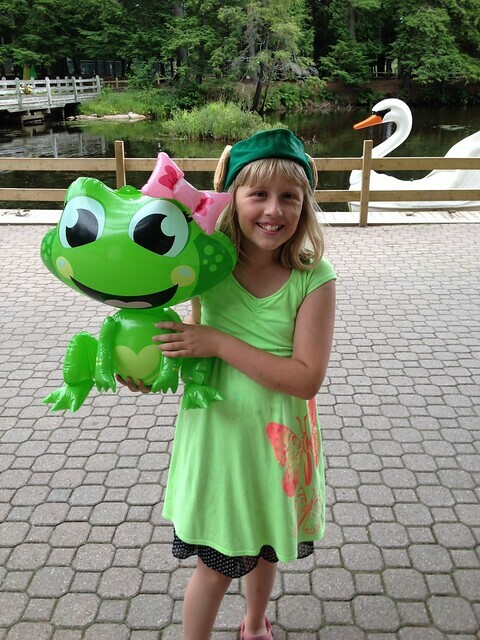 Adventures with Jennpup is excited to be hosting a giveaway in July 2015! We live in a sweet spot – somewhere between not quite poor enough for welfare and not quite rich enough to make ends meet. I believe it’s called “The Middle Class”! Always the optimist with High Hopes – there’s a lot to be learned – just look around! 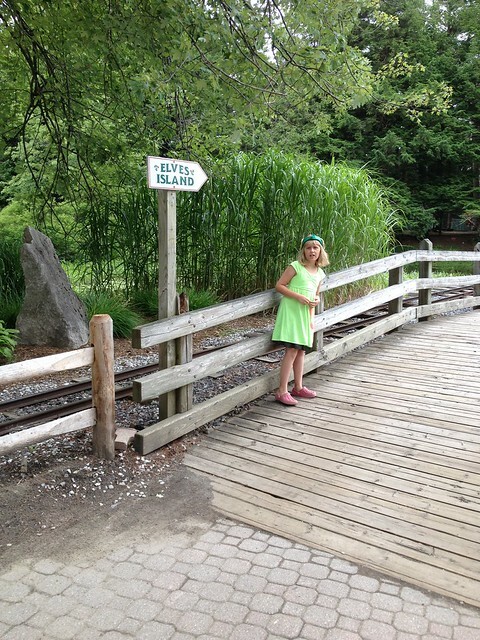 How can I give my kids the BEST SUMMER EVER with no budget for recreational activities? My answer has been ENTER TO WIN! 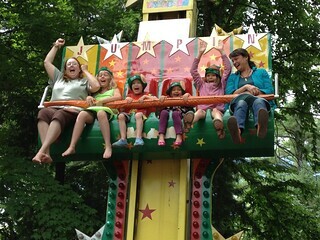 This blog series #BestSummerEver documents the summer fun we’ve had through pure wonderful luck! 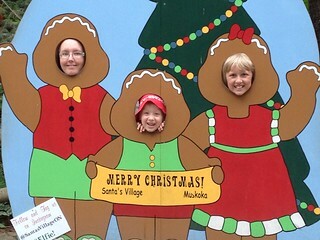 Santa’s Village in Bracebridge, ON is up first! Accepting the kindness of others is a gift to us as well as a gift to them, even though it is really hard to accept help! I am resourceful. Whether it is entering contests (see my blog “Winning“) or by researching what community supports and opportunities there are for my children and for my partner, I am very good at it! I love to share what I’ve learned with others! Hence, this blog, where I can let you know all about my latest finds and share stories and hopefully you’ll benefit from my research! 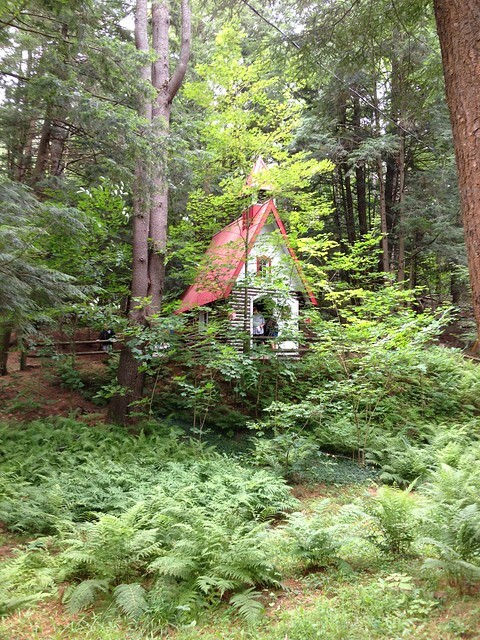 Welcome to the Blog – please join me on my Adventures!